English: Journey to the West (Traditional Chinese: 西遊記; Simplified Chinese: 西游记; pinyin: Xī Yóu Jì, WG: Hsi Yu Chi) is a classic of Chinese literature, and perhaps the most well-known amongst the younger generation. 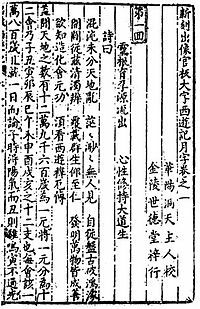 It was published anonymously in the 1590s, and no direct evidence of its authorship survives, but it is traditionally ascribed to the scholar Wu Cheng'en. The novel tells a fictionalized and mythologized version of the Buddhist monk Xuanzang's pilgrimage to India. Pigsy succumbs to earthly temptations by accepting food, while Xuanzang, unmoved, and Monkey look on. From Journey to the West by Wu Cheng'en, woodblock book, Chinese, 18th century. Xuan Zang, Dunhuang cave, 9th century. Эта страница в последний раз была отредактирована 31 июля 2018 в 09:37.